Tower Grove South is a massive neighborhood. It has so much to offer, and it is so diverse in different parts of the neighborhood. The southern half of the neighborhood if you use Utah Avenue as the border has many smaller, very affordable, but still beautiful homes. North of Utah is fairly swanky with lots of recently rehabbed homes. The South Grand commercial strip that defines the eastern border is highly functional and needs no description. The commercial strip serving the western half of the neighborhood is Morgan Ford Road. It has tremendous potential to improve around its anchor businesses that have been there for years. Right around Alpha Brewing Company, heading north to Arsenal is the stretch I’m referring to. A microbrewery, several bars, restaurants, retail, a small grocer and even a human foosball place exists along here. It’s a stretch with tremendous potential to improve even further. Any improvement to this stretch in the way of urban buildings and filling in holes that have popped up over the years is much welcomed. The area is extremely desirable to live and has improved greatly in my time living here. It has a walkability score of 77 out of 100, so it’s conceivable that you don’t have to drive everywhere for entertainment and the bare essentials. 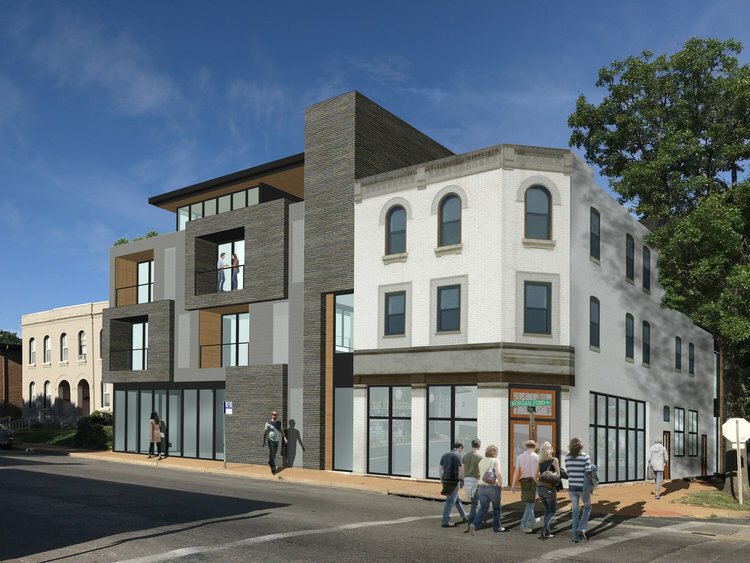 So, we were thrilled when we read of a proposal to rehab a beautiful corner building with new, modern infill immediately adjacent on an empty lot. 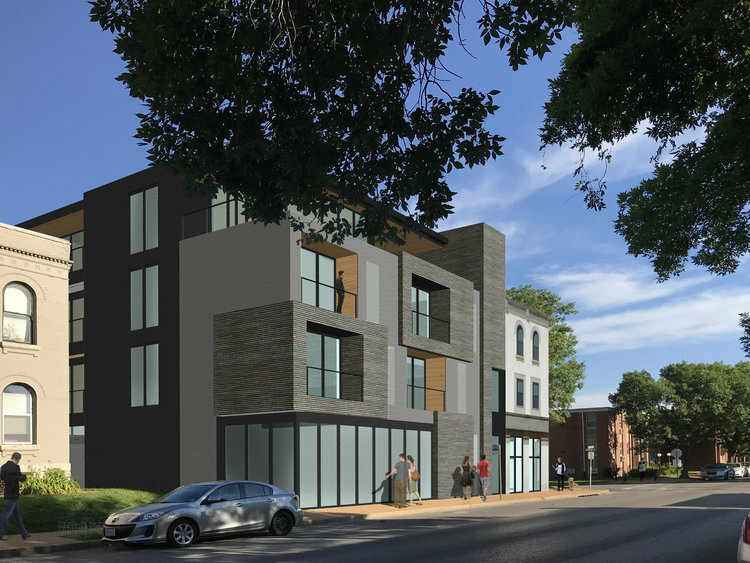 At the end of July, plans were announced for a $3.7 million mixed-use development at 3201 Morganford in Tower Grove South. The project includes 20 market-rate residential units and street-level retail in a unique blend of historic and modern architecture. The architect is JEMA, and the developers are Kyle Howerton, Rob Maltby, and Michael Anderson. The project will break ground just one block away from the same team’s $6.4 million, 26-unit mixed-use development at 3172 Morganford, which is currently underway. The intersection is near Wyoming and Morgan Ford. The painted white brick building in the following photos. That is just perfect, love it! With this project and the other development across the street mentioned in the NextSTL article, things are looking quite promising. The above development was on our 2017 favorites list, and as you can see, it’s coming along nicely. The building is a vast improvement over the car wash that was there. Now that there are prime examples of good urban infill, I’m hopeful that the less desirable buildings with surface parking lots fronting Morgan Ford will be upgraded in the future. I have nothing against the businesses themselves, I’m happy they are there, but the buildings they are in were mistakes in the vein of typical suburban design. You can see the 7-11 in the distance in the photo with the new construction is in the same suburban design with parking upfront. There is hope on Morgan Ford and this western commercial strip will make Tower Grove South even more of a destination and great place to live than before. I hope this one goes through and we can watch the strip evolve.